I am stamping on a tile from the flooring section of The Home Depot. I added little rubber feet to the back with glue before I started on this portion of the project. You will need the stamps of your choice and some glass paint markers from Deco Art. 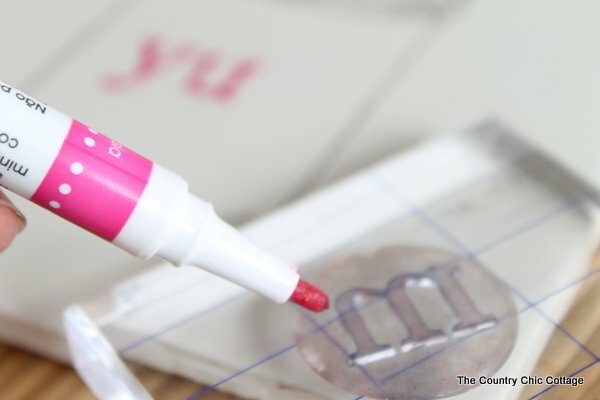 Just take the marker and write directly on the raised area of the stamps. Then stamp right on your project. Notice that the stamp will not be perfect. This initial stamping is just to get your outline. 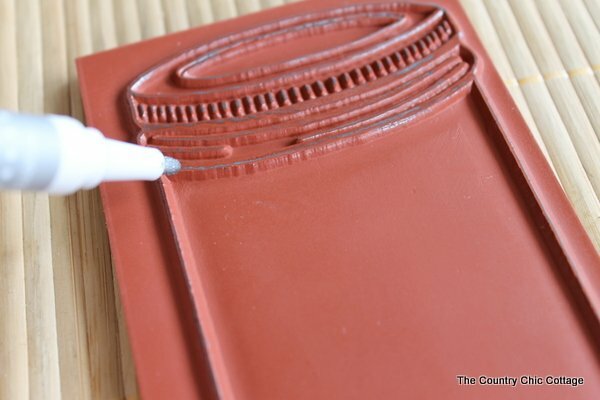 After stamping, just fill in the areas with your glass paint marker. Repeat with the letters. 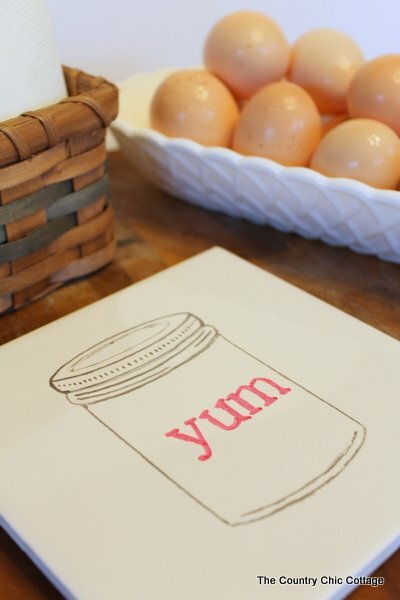 I choose the word “yum” because I thought it was cute inside the mason jar. 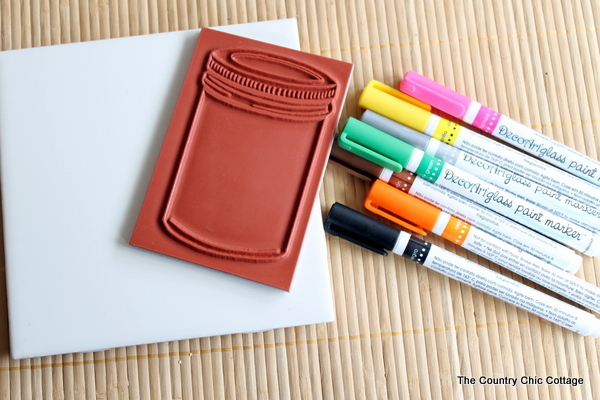 The glass paint markers dry so fast that you will be complete with this one in no time at all! 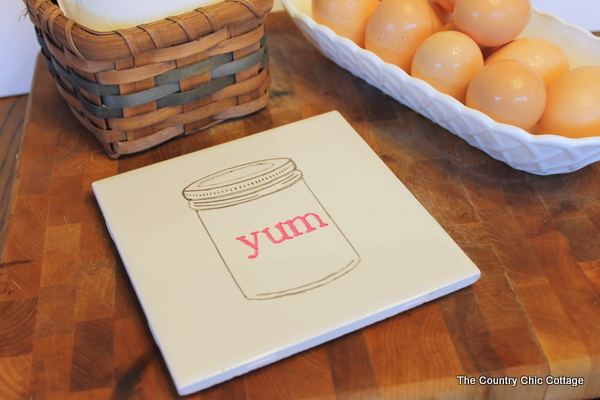 If you want your trivet to be dishwasher safe, please follow the instructions for baking your project (you will have to leave the rubber feet off your project until this is complete). I never run my trivets through the dishwasher so I am not concerned. 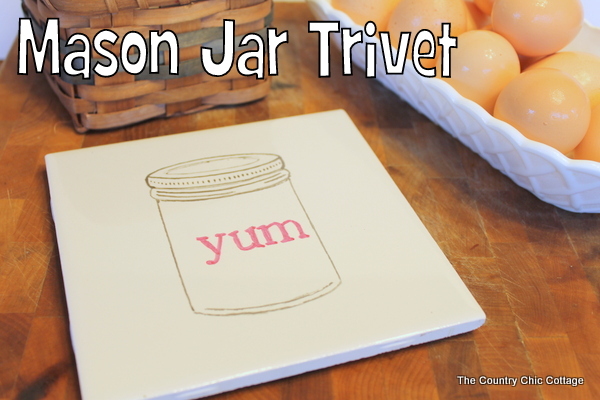 I love the touch of whimsy this “yum” mason jar is giving my kitchen both in the towel and in the trivet. I am wondering what else I can apply this treatment to. Y’all breakout your stamps and glass markers to make something cute this weekend okay? Some of the products in this tutorial were given to me from various retailers. All projects and opinions are my own. 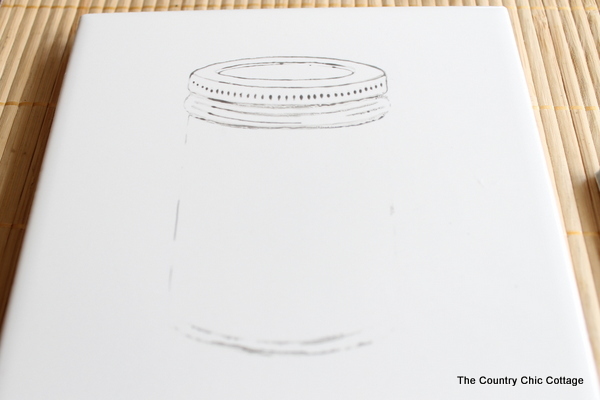 Want more ways to add jars to your kitchen? Try adding some mason jar lights!